I see thousands of worshippers in colorful African attire, praying loudly and fervently in Yoruba and in English. All accompany their prayers with energetic hand gestures and head motions. The frenetic group energy electrifies the massive tent, as "heaven-shaking prayers" and "Holy Ghost fireworks" are shared over loudspeakers. There is a sea of white plastic chairs as far as the eye can see, but no one is sitting down. Everyone is on their feet, praising and worshipping at the Mountain of Fire and Miracles church in the Surelere community in Lagos, Nigeria. The entire service lasts many hours, but it doesn't take long to realize this is serious business. These are believers. It's 5:30 a.m. Monks in flowing, orange, floor-length robes hold prayer beads in their hands and wear them around their necks. Some prepare for their day by performing their morning tasks. Many more are meditating — sitting and walking around the Hare Krishna temple in San Diego. A continuous, low buzz fills the temple as the monks speak and chant ancient and powerful mantras. The founder-acharya of the International Society for Krishna Consciousness, Swami Prabhupada, sits on a decorated altar in the corner of the temple. He meditates with a laser focus, eyes open, not moving a muscle for hours. It's a breathtakingly beautiful edifice — a white, nine-sided temple surrounded by gardens and fountains with a long flight of stairs from the street to the entry. The temple's intricate architectural styling is striking. Inside the enormous sanctuary, a quiet serenity exists, so calming you can feel the spiritual truths of the Bahá'í faith: the oneness of God, the oneness of humanity and the oneness of religion. The feeling of peace and unity and divinity within the temple is palpable. In each of these situations, I was there. Humbled and honored to be visiting each place of worship, I conducted my "52 Weeks of Worship," a global spiritual journey of healing, connection and remembrance. This journey was my way of finding my path through the pain of a very personally challenging 2009. In February 2009 I traveled to Atlanta to surprise my mother for her birthday. When I arrived there, I discovered that my father's cancer had advanced. He was admitted into the hospital that weekend and remained there, for the most part, throughout the year. While my father was fighting for his life, we received word in Apri 2009 from our family in West Africa that my maternal grandmother — the only grandparent I had ever known — died unexpectedly because of a fall from her bed and subsequent cranial bleed. In June 2009, I traveled to Nigeria, my parents' birth country, to stand beside my mother while she buried her mother — knowing that my father, her husband, would likely soon follow. He did. In August 2009, my father died from complications related to prostate cancer. My father was my hero. He was a physician and a philosopher, a philanthropist and a proud family man. He was my father, and now he was gone. In addition, as if there was not enough going on, by the end of 2009, it was clear that the four-year relationship that this unmarried 30-something woman-with-no-children-yet had enjoyed was over. My then-boyfriend decided that late 2009 was the best time for him to leave our union. I thought he might be "the One." It was devastating to discover he was not. Father — gone. Grandmother — gone. Boyfriend — gone. It was a holy triumvirate of personal pain. I was tired, bereft, disappointed and emotionally drained. I felt like God had forgotten me. At the beginning of 2010, I decided that spirituality would be the context from which I could make my journey back to myself. If I felt like God had forgotten me, then I would go look for him everywhere and in the eyes of everyone I met. I made a commitment to visit a different place of worship every week, whether that place of worship reflected my religious tradition or not. In total I visited 61 churches, temples, mosques, shuls, synagogues, living rooms and gathering places in the United States, Mexico, the United Kingdom, Nigeria and South Africa. Why? Why spend time worshipping side by side with Jews, Catholics, Muslims, Protestants, Scientologists, Jehovah's Witnesses, Unitarians, Quakers, Mormons, Seventh Day Adventists, Bahá'íans, Buddhists, Hindus, Methodists, Wiccans, Zoroastrians, mystics and Mennonites? Why spend countless hours in unfamiliar situations, with people I didn't know, experiencing traditions and rituals that I knew nothing about? Why share my pain and grief with strangers? 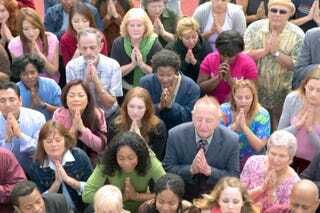 What was the power of praying with one another and for one another in different divine spaces all over the world? What was I looking for? What I was not looking for was a new religion, a new guru, a new deity or a new way to worship. I was not searching for but rather was expecting to find God in every place that I visited. In developing the habit of seeing God everywhere, I realized I was processing all the grief I was feeling. It felt good to proactively do something to rustle up some hope and optimism for my future. I was expecting God to help me heal from my pain, and figure out "What Next?" And I was not disappointed. I also believe in the kindness of strangers. Throughout my journey, I was able to soak in it. I have the best friends in the world, and I love them and mean that with all of my heart. But during a tragedy, it is often difficult to figure out what kind of support to ask for and how to accept it when it is offered. I knew my friends loved me, but when I was still struggling with missing my ex and the loss of my father and grandmother, I didn't want to bother my friends or expect them to support me when I knew they were all doing the best they could to handle their own lives. And the love! In every single service, there was a time that visitors were welcomed, hugged, prayed for and loved. The kindness of strangers sustained me, especially during times when I was concerned that I was leaning on my friends too much or that my grieving process was taking too long. With every worship experience, I remembered and honored the memory of my father, Dr. Ephraim Nseabasi Bassey. Throughout my journey, I was able to live the truth that was encompassed in his very name, Nseabasi, which means, "I am looking for God." Through my father's life, he worshipped as a Christian, while studying all manner of faith, religion and creed to discover the meaning of life and his place in it. He encouraged my sisters and me to do the same. During my spiritual odyssey, I honored my father's search for truth, as well as my own. Part of the joy and wonder of this journey were the many times I received a sign from my father that he was with me in spirit and in my heart, every step of the way. Every worship experience gave me an opportunity to remember my father in a different way. And each experience gave me a chance to learn about a new community of worship and the people who make up that community. Through different lenses, I experienced God and community and worship and religion and culture and family and love. Life now is far from perfect. I have not turned magically into someone who feels no pain, who always sees the silver lining and never has a moment of doubt. I am not holier-than-thou, and have not become an insufferable evangelist. Every now and then I throw a pity party, although they are shorter than they used to be. But my 52 Weeks of Worship rebooted my experience as a woman of faith and forged a spiritual foundation that helps me each and every day. When I started my journey, I was looking for a life vest. What I found was an anchor. Each worship experience helped me to face my grief and pain head-on. I came out on the other side grateful, strong and prepared to live a life where I see evidence of goodness and divinity all around me. Pamay Bassey is an entrepreneur, world traveler, writer, comedian and philosopher. She is writing a book about her 52 Weeks of Worship. Visit her site at my52wow.com. Follow her on Twitter.